President Donald Trump directed his outrage at Puerto Rico on Monday night, calling the U.S. territory "a mess" and its politicians "incompetent or corrupt," after Senate Democrats clashed with their Republican counterparts over sending more disaster aid money. Senators took test votes on two competing measures -- one drafted by Senate Republicans and another passed by Democratic-led House of Representatives earlier this year -- that would allocate billions of dollars in aid to U.S. states and territories ravaged by hurricanes, flooding, wildfires and other natural disasters in recent months. But neither piece of legislation got the support required to advance to a full floor vote. Democrats shot down the GOP legislation while Republicans rejected the House-passed bill, which proposes more aid for Puerto Rico than the Republican version. No one can discern where he’s getting that figure, which is many times higher than the actual number. Democrats said they wanted the federal government to release the money already appropriated to Puerto Rico in a previous relief package, in addition to hundreds of millions of dollars more. Republicans echoed Trump's claims that Puerto Puerto Rico has been given much more than disaster-hit states and hasn't spent the money wisely. "The Democrats today killed a Bill that would have provided great relief to Farmers and yet more money to Puerto Rico despite the fact that Puerto Rico has already been scheduled to receive more hurricane relief funding than any 'place' in history. The people of Puerto Rico," Trump posted on Twitter, "are GREAT, but the politicians are incompetent or corrupt. Puerto Rico got far more money than Texas & Florida combined, yet their government can’t do anything right, the place is a mess - nothing works." "FEMA & The Military worked emergency miracles but politicians like," Trump continued. "the crazed and incompetent Mayor of San Juan have done such a poor job of bringing the Island back to health. 91 Billion Dollars to Puerto Rico, and now the Dems want to give them more, taking dollars away from our Farmers and so many others. Disgraceful!" Carmen Yulin Cruz, the mayor of San Juan, the capital, responded to Trump's remarks in her own tweets. She called the president "unhinged" and accused him of lying about the inadequate response to Puerto Rico in the aftermath of Hurricane Maria, a Category 4 hurricane that made landfall on the island in September 2017 and caused some $100 billion in damage. "Pres Trump continues to embarrass himself & the Office he holds. He is unhinged & thus lies about the $ received by PR. HE KNOWS HIS RESPONSE was innefficient [sic] at best. He can huff & puff all he wants but he cannot escape the death of 3,000 on his watch. SHAME ON YOU!" Cruz tweeted. "Mr President I am right here ready to call you on every lie, every hypocrisy and every ill fated action against the people of Puerto Rico. My voice,and the voices of the people of Puerto Rico, will continue to unmask your insentive [sic], incapable & vindictive ways. SHAME ON YOU!" Cruz tweeted again. 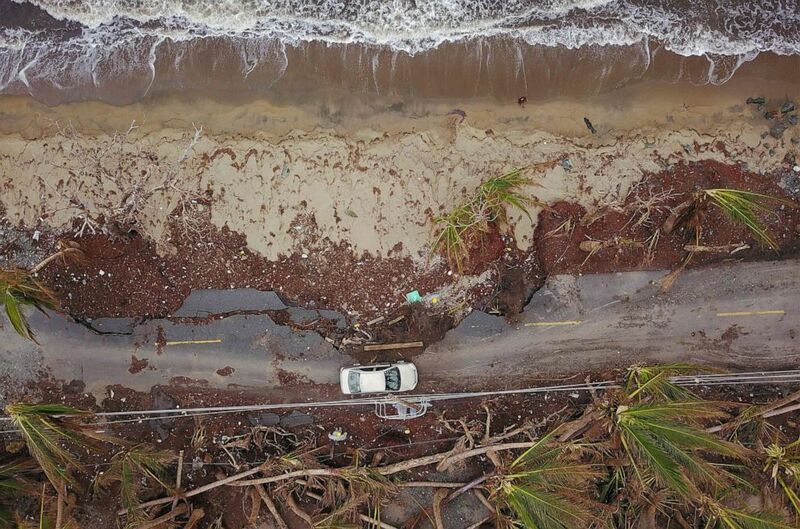 The storm struck as Puerto Ricans still were recovering from Hurricane Irma, which unleashed heavy rain and high winds just two weeks earlier. Though 64 people died as a direct result of Hurricane Maria, an estimated 2,975 died as a result of its aftermath, according to Puerto Rico’s most recent official counts based on a study, published in August of 2018, conducted by George Washington University and the University of Puerto Rico. (Ricardo Arduengo/AFP/Getty Images) A car drives on a damaged road in the aftermath of Hurricane Maria in Humacao, Puerto Rico on Oct. 2, 2017. Jeremy Kirkland, general counsel to the Inspector General’s Office at the U.S. Department of Housing and Urban Development, announced last Tuesday that his office has launched an internal investigation at the request of Congress to investigate whether there was any "interference" in the distribution of aid money to Puerto Rico. Over the weekend, Senate Minority Leader Chuck Schumer penned an op-ed in The New York Daily News, saying the Trump administration "has yet to disperse nearly $20 billion in long-term recovery and mitigation funds for Puerto Rico, more than a year after they were approved by Congress and a year-and-a-half after the historic hurricanes made landfall." "[The president] claims that Puerto Rico is getting $91 billion in disaster relief," Schumer wrote, "but no one can discern where he’s getting that figure, which is many times higher than the actual number." ABC News' Stephanie Ebbs, Anne Flaherty, Joshua Hoyos and Trish Turner contributed to this report.